What could one possibly say about good time Johnny von Neumann that isn’t known? His was widely considered to be the fastest, most wide-ranging, most original mind of the twentieth century. That the same man who laid the mathematical foundations of quantum mechanics also became the father of both game theory and (with Alan Turing) the modern computer is simply astonishing. In addition he helped build the atomic bomb, axiomatized set theory as Hilbert’s assistant, did early work in weather prediction and helped the United States get started on ICBMs. And he was just getting warmed up. It seemed that even the greatest scientists of the 20th century could talk about von Neumann only in superlatives. For instance, Enrico Fermi said that von Neumann often left him feeling that he knew no mathematics at all. And Hans Bethe said something truly interesting: if there were ever a race of superhumans, he wondered if the members of this more advanced species would not resemble Johnny von Neumann. 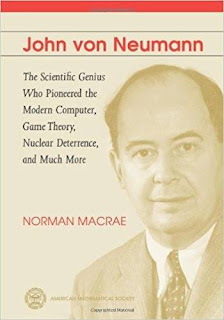 Norman Macrae – highly accomplished editor of The Economist for thirty years - brings a light touch, a genuine appreciation and an amusing style to the story of von Neumann, a bit like von Neumann’s mind itself. 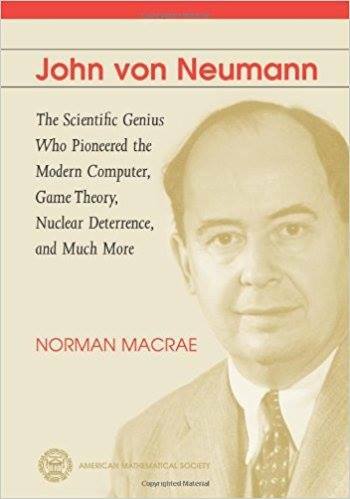 Macrae is not a scientist so this book is more about von Neumann the human being than von Neumann the mathematician. Johnny was a certified child prodigy who at age eight could multiply two eight digit numbers in his head, already knew six languages and had a photographic memory because of which he could recite entire books by heart. Combined with these qualities was an amazing ability to concentrate, and with great speed. Infused with a lifelong passion for history, he finished all 40 volumes of a multi-volume series of world history in a few days, and rumor has it that he would take two books with him to the bathroom, just in case he finished one and still had time left. When asked a question he would instantly jump ten steps ahead and solve a whole family of related questions. He would invent entire fields on train and plane trips. It helped tremendously that he grew up as the son of a wealthy banker in Budapest, at a time when the empire was crumbling. Along with his fellow émigrés Edward Teller, Eugene Wigner and Leo Szilard, he became part of the group of Martians, men with rarefied intelligence who had apparently disguised themselves to fit well in human society. Many years later, Wigner who won the Nobel Prize and was one of the foremost theoretical physicists of his time was asked why Hungary in that short time produced so many geniuses like himself. You are wrong, said Wigner. Hungary produced only one genius, Johnny von Neumann. But anti-Semitism and political turmoil certainly helped, as did Hungary’s high schools which were among the best in the world. Macrae’s book does an excellent job tracing von Neumann’s background and the political developments during and between the wars in Europe. Only Szilard was more prescient in seeing the cloud of fascism blow over the continent. Along with Einstein, von Neumann thus became one of the first scientists to leave Europe in the early 30s. He settled down at the Institute for Advanced Study, helping other émigrés like Kurt Gödel (whose incompleteness theorem he was the only one to truly appreciate when Gödel first presented it in 1931) settle down. It was at the institute that he built his famous computer until the pure mathematicians who wanted to preserve the sanctimony of the place howled and shut it down, passing a motion not to build anything smacking of engineering in the place ever again. Equally comfortable in the highest reaches of both pure and applied science, von Neumann quickly adapted to his country’s war needs, first working on ballistics and then making himself the country’s foremost expert on shock waves. It was this work that led to an invitation from Oppenheimer at Los Alamos, and he contributed a key idea to the plutonium implosion bomb regarding the squeezing of plutonium using explosive lenses. Everyone could rely on him to transform their thinking in a few minutes or hours. After the war he continued to be the most highly valued defense consultant in the country, advising every government organization except the Coast Guard on ballistics, nuclear weapons, submarines and missiles. And all this time he continued to lay the foundations of computing and its applications to fields as diverse as hydrogen bomb design and meteorology, first with J. Presper Eckert and John Mauchly at the University of Pennsylvania where he worked on the ENIAC, and then with Julian Bigelow and Herman Goldstine at the Institute for Advanced Study (a story nicely told in George Dyson’s book “Turing’s Cathedral”). Von Neumann came up with the idea of the stored program, realizing along with a select few others that numbers could be used to encode both instructions and their results. The von Neumann architecture remains a part of computers to this day. In the last days of his life he also worked on self-replicating automata and drew prescient parallels between human and machine thinking. The latter were published as “The Computer and the Brain” which still makes for highly original reading. There is little doubt that many of von Neumann's prophesies about the weather, the brain and computing are still waiting to be tested. But enough about his amazing mind and scientific feats which are well known. Two things about von Neumann from the book are perhaps not as widely known or appreciated. First was his unusual personality. Von Neumann defied the image of the mathematician with his head in the clouds. He exuded bon homie and loved fast cars, rich food, dirty jokes, expensive suits (he wore one even on a mule during a hike in the mountains) and raucous parties (in the middle of which he could intensely concentrate on and solve important mathematical problems). Unlike other mathematicians he felt more at home with generals and admirals rather than with fellow academics. Unfortunately, similar to other great scientists, his family life was messy. His first wife Mariette left him for another man, partly because of his self-obsession with mathematics. His second wife Klari was very intelligent but also neurotic, and she committed suicide by walking into the ocean a few years after his death. Fortunately his daughter Marina became one of the most prominent women of her time, serving as the first woman on Nixon’s council of economic advisors and then on the board of directors of General Motors. She has written a first-rate memoir of her own life titled “The Martian’s Daughter”. What really stands out, however, is Johnny's perpetually jovial nature and his friendships. During those troubled times he called himself a cheerful pessimist. Of all the important people of the time, he is the only one I know who managed to be friends with people who were each other’s sworn enemies. For instance, he testified on Oppenheimer’s behalf at the latter’s infamous security trial. The man who orchestrated the trial was Oppenheimer’s sworn enemy Lewis Strauss, the vindictive politician who had initially offered Oppenheimer the position of director of the IAS in Princeton. And yet Strauss remained one of von Neumann’s most steadfast supporters and genuine admirers, nominating him to the Atomic Energy Commission and making sure he got special treatment during his last days when he was struck down too early by cancer. Von Neumann similarly stayed good friends with both Edward Teller and Stanislaw Ulam who clashed severely over a priority dispute about the hydrogen bomb. Everyone seemed to like Johnny, and the main reason was that he would stay away from public insults or political arguments, often defusing political disagreements with a ribald joke. His philosophy was simple: keep on doing good work and be a decent person and then don’t worry about anything else. You are not responsible for what others think about you; a philosophy that Richard Feynman said he imbibed from Johnny. The other interesting thing about von Neumann was his politics. Unlike the vast majority of his friends, he was a conservative, right wing Republican. His opinion that the US should be ready not just for a preemptive strike on the Soviet Union but a preventive one was admittedly an extreme one. He did not seem to realize that even talk of such things would raise the risk of nuclear annihilation. And yet there was a certain logic to his thinking. If a hydrogen bomb or a whole fleet of ICBMs was possible, he wanted the United States to be the country that got them first. Many others thought similarly, and while one can disagree with their thinking, one can also understand their internal logic. In our own times, von Neumann provides a role model of how people can vehemently disagree on politics and still be good friends. Von Neumann’s death was heartbreaking, and there is no sugarcoating it. Here was a man whose sole purpose for existence seemed to be to think. When he realized at the early age of fifty-three that he had terminal brain cancer, he also realized that his mind would soon stop thinking. This was unimaginable for him and he had nightmares. He had so many military secrets in his head that he was moved to a special suite at Walter Reed Hospital in Washington and surrounded day and night by armed security guards to make sure he did not accidentally give out secret information. His friends constantly visited him and came away distraught. Lewis Strauss once recounted an extraordinary spectacle; this recent immigrant lying on a hospital bed, surrounded by the secretaries of the army, navy, air force and defense and the chairman of the joint chiefs of staff, everyone hanging on to his every word and squeezing every bit of information from his extraordinary mind. His brother Michael would read Goethe’s Faust to him, and until the very end, with his prodigious memory he would start reading the next page automatically. His daughter Marina recalls one particularly heartbreaking incident when he called her into his hospital room and asked her to ask him to add and divide simple numbers to test whether his mind was still intact. She could not stand it after a few minutes and left the room. As the end drew near, von Neumann had a Catholic priest summoned and converted to Catholicism, hedging his bets, hoping that the small chance of an afterlife promised by religion might yet save him. Everyone was horrified and confused by this action. They could not believe that the most rational mind of the century would cling to this seemingly irrational thinking. On the other hand, his act could point at truths that only Johnny von Neumann’s mind could access that were entirely rational. I would like to believe the latter.